Mars colonists perform an EVA (extravehicular activity) to make repairs to their power supply. (From left): Anamaria Marinca as Marta Kamen, the Russian exobiologist and geologist; JiHAE as Hana Seung, the Korean-American mission pilot and software engineer; and Cosmia Shaw as Leslie Richardson, the British nuclear physicist and leader of MMC's Phase 2 team. 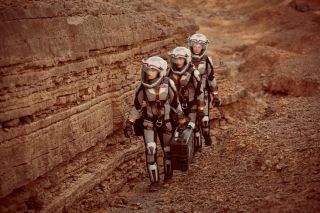 National Geographic's "Mars" TV series is coming to an end with the sixth and final episode airing tonight. The fate of the fictional Mars colony and the future of human space exploration are on the line after a major disaster on the Red Planet. Will the crew tough out their troubles, or will they be forced to give up the mission and return to Earth? In last week's episode, titled "Darkest Days," the Mars colonists suffered a devastating loss that could mean the end of the mission after four years of building a home on the Red Planet. On Earth, the Mars Mission Corporation (MMC) and the International Mars Science Foundation (IMSF) must decide whether to bring the colonists back home and leave all their hard work behind. On Mars, Commander Hana Seung wonders whether the whole operation will be "a giant leap forward or a passing novelty," like NASA's historic manned moon landings in the 1960s and 1970s. Hana Seung, the Korean-American mission pilot and software engineer who becomes commander of the colony at Olympus Town, inspects the Daedalus spacecraft after four years of standing unused on Mars. An attendee at the meeting points out that NASA accepted that same risk in the 1960s when they put the first humans on the moon — but that was a matter of national defense, as the United States was in the middle of the space race with the Soviet Union. But even then, the fear of losing American spacefaring heroes played a major role in the end of the Apollo program, as experts will discuss in the interview portions of tonight's series finale. In 1970, a spacecraft malfunction nearly turned the Apollo 13 moon mission into a deadly disaster for the three astronauts on board. They made it back to Earth alive, but then-President Richard Nixon proposed canceling all future manned moon missions out of fear that any subsequent astronauts would not be so lucky. Is the extraordinary adventure on Mars worth the risk of death? Members of the IMSF worry that they could lose public support when heroes are lost. Yet some argue that giving up the mission would be embarrassing after having invested vast amounts of resources and delivering grand speeches about their goals and ambitions. Officials with the International Mars Science Foundation debate whether the Mars colonists should stay or leave after a major accident. To find out what the powers-that-be decide to do with the Mars colonists and their settlement, tune in to the National Geographic Channel tonight (Dec.19) at 9 p.m. EST. There's a major game-changing (and potentially tear-jerking) surprise at the end, so you don't want to miss it! Learn more about National Geographic's "Mars" project and the International Mars Science Foundation at their multimedia website, www.MakeMarsHome.com.